Do you travel a lot? Do you have a full-time job? Do you hate waking up in the morning to feed your cats? All these are issues that will interfere with the feeding habits of your cats. If you want to ensure that your beautiful kitties have enough food and water, buying the best automatic cat feeder for multiple cats will keep you and your cats happy. You don't have to worry what your cats are doing or whether they have enough food when you are away. Automatic cat/pet food dispenser comes in different sizes, shapes, and features. Choosing the right one from the many models on the market can be difficult. Luckily, I have done the work on your behalf. I have reviewed top 10 best automatic cat feeder to help you pick the right one. After spending over 40 hours or research, analysis, and testing over 50 models. The following models are our top picks. If you want to keep your cats fed and happy, purchasing an automatic cat feeder is the best thing to do. The following are reviews of quality automatic feeders that will help you manage the feeding schedule of your cats. PetSafe is a convenient automatic cat feeder that allows you to feed cats the right amount of food. It has two preset meal portions so you can feed your cat twice a day at 8 am and 5 pm. On top of that, there is a user option that helps you customize the feeding schedule for up to 12 meals a day. It is designed with a translucent hopper that can hold up to 24 cups of dry food. There are different multiple feeding options that you can choose. It has a slow feed to prevent your cat from eating too fast. There is also an immediate feed for instant meals and a pause feed if you want to stop feeding temporarily without affecting the feeding schedule. A good automatic pet feeder should be easy to maintain. This is why this model provides you with a quick setup and cleaning. It features easy navigation combined with preset models to offer quick programming for cats and dogs. Again, this feeder is made with a BPA-free plastic and stainless steel material. For the convenience of use at any place, the feeder is battery operated. It uses 4 D alkaline batteries but they are not included. The batteries have a longer life for up to one year. Maintain a cat is pretty easy as compared to a dog but you still need to make sure that he gets the right nutrition every day. If you travel a lot or have a demanding job, you need to know how to feed cat wet food while away. Feed and Go Automatic Feeder works well for both wet and dry food. In fact, this is the best automatic cat feeder for wet food. Using this automatic feeder is convenient because it allows Wi-Fi connectivity to your home network. Using the new iOS and Android apps, it is easier for you to schedule one time or regular feeds for your cat anywhere. If you have multiple pets, you can switch to unlimited feeds. It also gives you the option of fiving your cat medication. Want to know how your cat is fairing? No worries because you just need to use the webcam button but it doesn't have a night vision. As long as you have Wi-Fi connection, you can check your cats anywhere at any time. For people who would love to feed their cats while on the go, this is a great automatic feeder that will suit your needs. If you are feeding your cat wet food, make sure it doesn't stay for more than 24 hours. As a pet parent, I would rather stay at home with my pets. I have three lovely cats but sometimes with work and other commitments, being there all the time can be hard. But does this mean my kitties will stay all day without food? Of course not! With the SureFeed Microchip Pet Feeder, I have no worries even when I'm away. If you have more than one cat, you understand they all have different eating habits. Some cats eat more than others. This automatic cat feeder is designed to suit multiple pets. It prevents pets from stealing each other's food. This unit is ideal for pets on prescription weight management or diet. It ensures that the right pet gets access to their food. To ensure that there are no contaminations of the food in the bowl, there is a lid that seals the bowl well. This means that the food will stay fresh longer and no flies will get inside the bowl. Thinking of the best gift to give a pet lover? Think no further than the CSF-3 Super Feeder. This is a great automatic feeder that will help you keep healthy and well-fed pets. It comes with two top quality and indestructible polycarbonate 2 cup clear extensions that hold more food. This compact automatic feeder can hold up to 4 and ¾ cups of food. You can also increase the capacity with two extra clear cup extensions. With just one timer, you can trigger the multiple feeders which make your work easier. Unlike others feeders, this one is easy to operate. You will also get personalized customer support in case you need help. With just a screwdriver, you will need to do some simple assembly and it is ready for use. It has a freestanding design so you can place near the wall, cabinet or across corner wall. If your pet is mischievous, you can choose to mount it on the wall as compared to using a short stand. You should not install this feeder outdoors especially if you don't have wildlife protection. The lusmo automatic pet feeder can be a great way to control the amount of food your cat eats and when to eat. You don't have to be always there to provide your cats with regular meal. This can be a great automatic cat feeder for two cats. The feeder is designed in a way that it outsmarts your mischievous cat or dog. Clever cats find it hard to snitch bait and dogs also find it hard to open the cover of the bait tank. Using this device is simple because there are only three buttons to operate. Additionally, the large clear display makes it easy for you to check the right program setting easily. Depending on your needs, you can set a 24 hours timer to repeat the feeding schedule. This repeat operation runs daily at the same time you don't have to keep setting the time each day. The buttons will help you adjust the program if you need to. The tank has a large capacity that can hold food to last from 10-14 days. This automatic feeder can be a great purchase if you take longer trips. It also has a manual feeding mode if you don't want to use the automatic feeding mode. Pets love to be fed on a schedule but sometimes their feeding schedule might not get well with your schedule. If you are a pet owner on the go, having the petsafe 5-meal pet feeder can help you maintain regular feeding schedule for your cats. This feeder is designed with a digital timer so you can easily set the required feeding times increasing by one hour for up to 5 meals in a day. You can get this feeder to help you manage the weight of your pet. This battery operated cat feeder gives you a quick and straightforward setup. It is designed with a digital LCD display to eliminate any guesswork when setting the meal. It is also designed with BPA free materials so you can be sure that your cat is feeding on a healthy feeder. If you cat overeats, then this unit can help them control overeating. It is designed with slot trays that can hold up to 1 cup dry or semi-wet food. This gives you the chance to feed your cat with small and pre-positioned meals during the day. Automatic pet feeders are perfect for homes with pets. Even though you can prefer to feed your cat personally, sometimes you might not be there or have the time to feed your cat. Automating the task makes your work easier and your pets healthy. This automatic feeder is perfect for cats and dogs. This is a handy feeder for people who have a busy life and cannot manage to be there to feed the cats all the time. 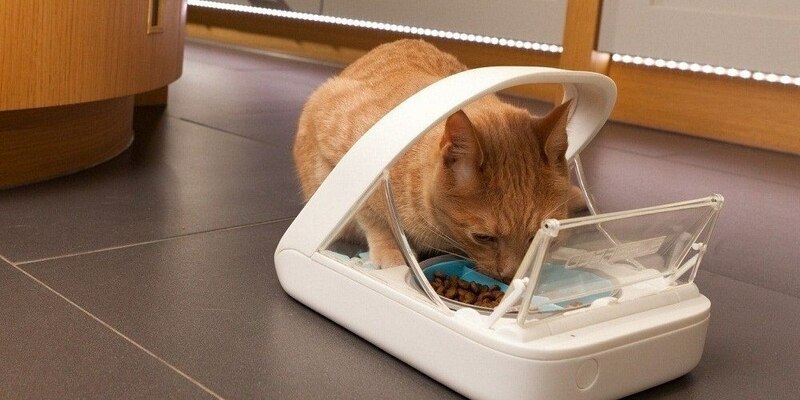 You don't have to worry about your cat missing meals or snacks when you have this feeder. You just need to fill it and set the timer when you want it to dispense food. It has a large 3lbs container for dry food and flexible meal portions from 1-39. This feeder provides accurate feeding because when you set the timer, you can schedule up to 4 meals in a day to ensure your pets easy healthy. If your cats love your voice when eating, you can record your voice in 10 seconds. This feeder also features a built-in infrared detection that prevents the food from locking. This gives your lovely pets the chance to enjoy every meal. There are so many automatic cat feeders on the market today and choosing the right one can be frustrating. Because you do not want to pick any model that you come across, I would recommend the Bergan Petite Gourmet Combo for all your pets feeding needs. Bergan Petite Gourmet Combo makes pets and pet owners happy. It can hold a maximum of 6 lb capacity of pet dry food and water up to 1.5 gallons. Having this combo is perfect for people with multiple pets or those who love traveling. It keeps your pets fed and hydrated even when you are on a vacation. The unit is sturdy enough such that it can't be knocked down easily to eliminate messes. You will also have a simple time when it comes to cleaning. There is an included lid that prevents splashing and this greatly helps to maintain the feeding area neat. Maintain a healthy cat feeding schedule with the Petmate Pet Cafe Feeder. This is a convenient automatic feeder for both cats and dogs. It utilizes gravity feed technology to dispense dry food. Parents with busy lifestyles can now ensure that their pets are well fed because they have access to food. This feeder is easy to clean. It is designed with a wide removable mouth bottle for easy handwashing. Loading food is also simple. You just need to remove the easy snap lid from the feeder to put food in the container. It is designed in a way that the feeding area stays neat when feeding. It features a sturdy base and spill-free food station. You will also love the easy grab cutouts to help you lift it without any spills. With an automatic cat feeder, you don't have to worry about waking up early or late night to feed your cats. Cat feeders not only provide your pets with on demand food but some models also come with a feature like slowing the feeding for cats that eat fast. Bergan 5 lb Travel Feeder makes it easy to feed cats while you are away. You no longer need to look for professional pet sitters to feed your cats when you are not around. The feeder is designed with a translucent container so you can see the amount of food in the container. It is easy to use and made with BPA-free materials. This feeder also meets the requirements of FDA so you have no worries about its quality. It has a large opening that makes filling easy. Its total capacity is 24 cups. Before you purchase an automatic cat feeder, it is important to consider the number of cats in your household. If you have different pets, I would advise you to purchase separate automatic feeders. If you have one feeder, some pets can feed aggressively and prevent others from accessing the food. There are different types of feeders out there so you need to ensure that you are getting the right one. Some are made for bigger pets while others are designed for smaller pets. Again, if your pet is overweight, you need to have an automatic dispenser with a timer so that it can provide the required amount of food at the right time. Is your cat used to feeding at specific times? If so, you can set the timer and feed them at the same time. It could be in the morning, noon and evening depending on how you feed your cats. You can get most timers with that to provide meals 3 times a day but there are other models with different portion sizes. Having a timer prevents your cat from overfeeding and helps if you want your cat to lose weight. Automatic cat feeders are available in both battery and corded models. A corded automatic feeder allows you to put the feeder anywhere so you don't have to worry about plugs or tipper over the wires. On the other hand, if you don't want to deal with dead batteries when you are away, you can pick a corded model to avoid leaving your cat without food. When you are away, many pets can be hesitant to eat. If you have an automatic cat feeder, you can ensure that your cat eats every day. Some feeders give you the chance to record your voice and it plays when food is dispensed. Does it work well with wet food? If you feed your cat wet food, you might not have many options to choose from when it comes to automatic cat feeders. You need to look for an automatic feeder that will prevent the food from going bad. In this case, a refrigerated automatic feeding system or feeders with ice packs at the bottom can keep the food cool. If you want the food to last longer, make sure you refrigerate before you open it. Can it used by cats and dogs? Some models are specifically designed for cats while others for dogs. However, feeders for cats can be used by small dogs. But you need to understand that cats and dogs have different feeding habits. You can also visit petshaunt.com for more buying guide details regarding pets. Do you need a gravity feeder? If you have more than one cat, any of the above models will suit your needs. I picked the best automatic cat feeders on the market today that will help you feed your cats when you are not away. Automatic cat feeders give you peace of mind since you don't have to worry whether your cat has enough food. Again, as compared to hiring pet sitters when you are away, purchasing an automatic cat feeder is convenient and affordable in the long run. Compare each of these models to find features you want and I'm sure you will get a feeder that will suit you well.